The Quarter was marked with improved revenue numbers, better leveraged EBITDA and better profit resulted. On Consolidated level the net revenue increased from Rs.308 Crores to Rs.430 Crores resulting an increase of almost 40% and EBITDA increased by 21% from Rs.38.2 Crores to Rs.46.3 Crores and the net profit increased 38% from 7.8 to 10.7 Crores. The incongruity in the growth for Revenue and the EBITDA is due to underperformance in the PEBS vertical & Cash profit increased from Rs.16.7 Crores to Rs.21 Crores. The growth was led by the Systems and Projects business that registered a 106.5% Y-o-Y from Rs 68 crores in FY2016 to Rs. 140 crores FY 2017.This higher margin unit contributed to the overall profit. The Order booking in the railways is at Rs.130 Crores and the company expects to it to go up in the next few quarters substantially. The company is a raw material intensive industry where the cost of ram materials hovers around 55-60% so the spread is thin and margin performance ins moderate. The company is though eyeing to get close to the peak margin of 13% through business addition having a higher ROCE. Any business that do not supply 10% ROCE is futile and the company will exit the same. GP(Galvanised Plane), the strip galvanising line is a new initiative by the company started 1.5 months back. So far it has been successful and the sales of Rs. 100 crores will be achieved. 5 crores against Rs. 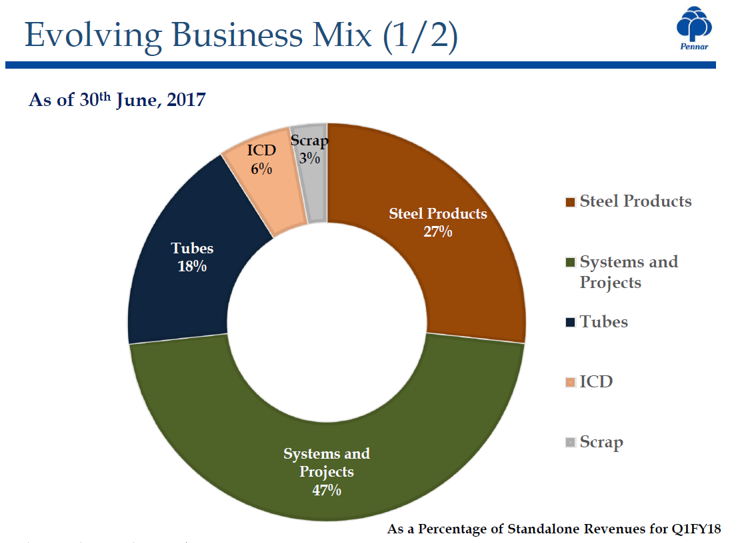 35 crores for FY 2017 mainly due to strategy to expand in the tubes vertical which is faster cliff for revenue generation. Exports is a focus area for the company. It is already shipping the CDW tubes to US. Comprinox and Salem Steel are other customers. It has also set up sales office in US to driveBthe marketing ventures. Railways business is basically categorised into two pieces, wagons and coaches.In wagons, the prospects are not very bullish on wagons but Coaches on the other hand have a very well defined plan for growth, so the majority of scope for revenues is in Coaches. The company has seen rapid revenue rise in Integrated coach factory, BML and MCF. Railways is one of the fastest growing businesses. The Market is Us is large enough to accommodate new operators to the proposed JV in US i.e between Pennar Industry and PEBS is adding not only the Industrial components I.e solar module mounting, tubes, hydraulics business, even the engineering services business in PEBS. On output level the segment has reached 1300-1400 tonnes per month. This is bound to increase with capacity addition in Annealing and Auto gauge control. The company is asserting anywhere around an output level of 3000 tonnes a month. Tubes business vertical also had very growth from Rs.40 Crores approximately Q1 last year, we grew to Rs.54.9 Crores, growth of 37.7% and even our EBITDA grew from 3.2% to 4.6%, which is the growth of 40%. CRSS affected by the raw material cost volatility so the company has entered into quarterly rate contract to get reprieve and generate margin. ERW and CDW are both the growth drivers and there is huge scope for meeting the supply gap as last year company booked contracts worth 1600 tonnes but supply only 1000 tonnes. The company has invested in stainless tubes business whose primary customer will be Integrated coach factories, pharmaceutical companies and some other process industries. This is a new technology product and there is scope for leverage in Exports. The company expects the substantial revenue from this FY itself. In Pennar Enviro business model that the company has adopted is one of quickly picking up references and prequalifications. The operating margins for this vertical are good. The addressable market size for that business is very, very high in tens or thousands of Crores. So, there is no market impediment to growth.